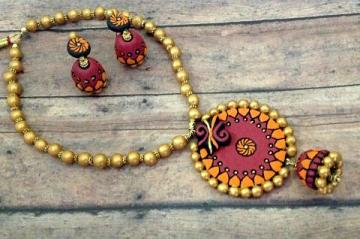 Gold, Red and Orange handmade & hand painted Terracotta Jewelry Set. The set includes Chakra shaped Jhumka earrings and necklace Set!!!!! Buy Red & Orange Terracotta Chakra Necklace Jhumka Set, sold & shipped by SowJy where you can shop online for Unique Handmade Terracotta, Fashion & Designer Ethnic Jewelry. This Necklace Sets collection has been tagged as Colorful Unique Handmade Necklace, Gift Set, Jhumka Eerrings, Terracotta, Clay Jewelry. Cute owl Set Dressed in Brown Glass Beads!!!! !